They’re overloaded. They don’t have time to focus on the core strategic work that boosts competitive advantage and shareholder value. Their team is stretched too thin. They simply can’t handle every task like event program management, marketing communications, executive communications, or digital and social media marketing. Their team lacks a particular expertise. They need to supplement with new or specialized skillsets to stay competitive. How outsourced marketing can help you regain some sanity. 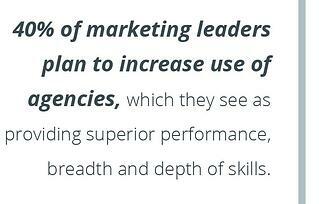 Outsourced marketing can provide your organization with a range of benefits. It can give you access to higher-quality talent than you might be able to attract in-house. It can eliminate the need to engage with multiple expensive creative or digital agencies by bringing in a single person or team with just the right mix of media, creative, and technology skills. And it can reduce overhead while enabling you to quickly scale up or down based on the economic environment. The best outsourced marketing agencies supply you with skilled people who can hit the ground running and support all your short or long-term needs. They use service-level agreements (SLAs) to clarify responsibilities and measure results. And they offer backup and continuity when your business grows, downsizes, or goes through personnel changes. Why partner with Crawford Group? For over 18 years, leading technology companies have partnered with us to find the best consultants for their marketing, events, and communications needs. We are a leader in providing marketing workforce solutions; from a single marketing consultant to a fully outsourced managed marketing service. Find out how we can help you strategize, scale, and achieve your marketing objectives. Send us a quick message using our contact form.